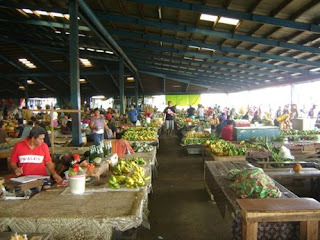 Note: The open-air Fugalei market is often simply referred to as “The Market”. Fugalei is the name of the place where The Market is located. In this post, I will mostly refer to it as The Market. 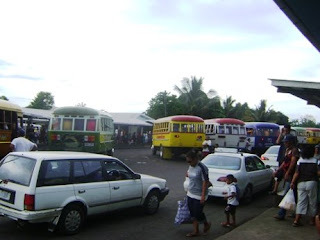 In part because of its proximity to the hotel the Peace Corps commonly uses, the Fugalei market was one of the first places we were taken after arriving in Samoa. Since it is an open-air market with no doors or fences, it technically never closes, although the number of vendors varies greatly depending on what time you show up. Vendors often sleep at the market, and the few times I’ve been very early in the morning, the place has always had at least 30 people sitting around. While produce is my main reason for coming to The Market, it is a low-budget commercial center where consumers can shop at many of the small general stores, tourists can purchase souvenir t-shirts and sunglasses, students can get hot fast food (keke pua’a, panekeke, etc. 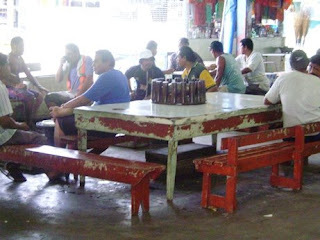 ), men can sit around and drink ’ava, and out-of-towners can catch a bus. 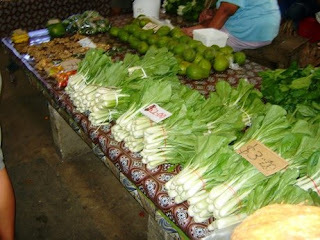 Though many vendors sell more than one item of produce, there does seem to be general groupings. The pumpkin sellers are front and center, the people who sell cooked taro sit in the back, the ones with the more exotic produce (ginger, peppers, green onions) sit near the ava circles. Smaller goods are sold in bundles. They are stacked on top of one another and the posted price is for the entire stack. You cannot by an individual orange or a single taro; you want one, you pay for the whole thing. 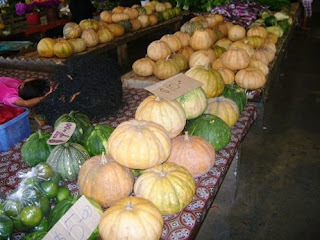 Larger fruits and vegetables (papayas and anything larger, maybe?) are sold individually. In my experience, vendors have been cordial and happy for my business, although I sometimes feel a bit uneasy. I have lots of experience in discerning which are the good apples, the best carrots; I know how ripe I want my American bananas to be. 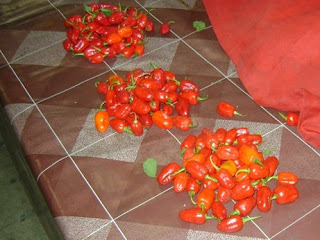 But some of the fruit at The Market is exotic enough to fall outside the area of my expertise. 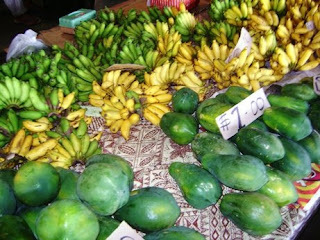 Sensing my inexperience, vendors can be quick to suggest a particular bunch of star fruit or choose the bag of vi for me. It’s hard to know whether their advice is genuine, or if they’re pawning off the runts of their litter on a confused palagi. I haven’t had too much experience with the rest of The Market. Dan, Supy, and Koa sat down in the ’ava circle during training and received generous amounts from the guy running the bowl. There are some souvenir t-shirts that are commonly worn in Samoa by Peace Corps and Samoans alike, and I’d like to get a couple at some point, but I’ve been able to control the urge so far. I hope things are well back home. Please enjoy the grocery photos below. The green fruit in the middle are vi. Not sure what they would be called when not speaking Samoan. They have a flesh somewhat similar to that of an apple. Not sure what this is. Kale? Lettuce? Not sure exactly what this is. Seems like a cross between Chinese cabbage and bok choy? Maybe? The bus loading zone next to the market. I like the new blog design. The palm tree is very familiar but where's Isaac? 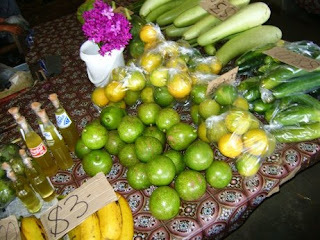 I love the pictures from the market! I also LOVE the new blog design. The shadow is super cute! The vegetable you weren't sure about I call bok choy. 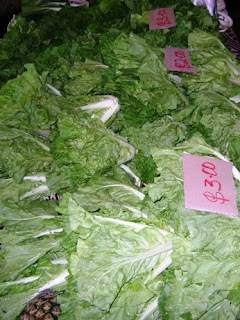 There are so many varities of choy that I'm probably wrong, but it tastes the same to me.